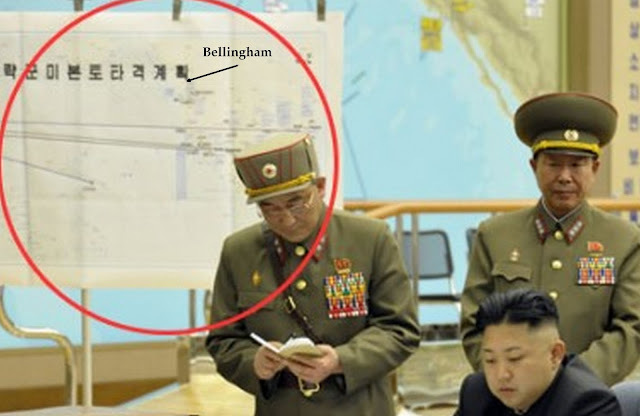 Looks like Kim Jong-Un and his generals aren't targeting the Canadian border cities with nuclear ICBMs for now. I just can't follow the Obama administration on this one. Did you know this type of kid in your elementary school? A little strange, paranoid, secretive, maybe abused even. Never really talked much to anyone, but became a complete psycho if someone actually decided to frack with him? Hey, Mr. President, that's your profile for North Korea. Maybe if we hadn't blown up their oil refineries and carpet bombed their nation 60 years ago in the first great cold war event of the last century... But then we didn't help matters when we called them part of the "axis of evil". (Notice that two out of the three "axis of evil" nations - Iran, North Korea - are now developing nuclear ambitions.) Just last week, we flew undetectable B-2 bombers over the Korean Pennisula and then bragged about it. All of a sudden, instead of a loner you've got a shooter, claiming to have nuclear ICBMs targeted on our cities. Hmmm... Don't give the angry loner a reason to wipe us off the map, Mr. President. You aren't making my family safer by pushing Kim Jong-Un panic buttons and spending billions on some shaky missile shield technology in Alaska. I'd prefer you spend my tax dollars on foreign aid rather than missiles in this instance. Better yet, why don't you withdraw our troops, send in negotiation teams and try to help unify the Korean Peninsula. Then spend our money on improving math education instead of policing Asia; so our students here can at least catch up with students in South Korea.